Seldom does the user of PowerPivot have all of the data they need in one nice, neat data source. More than often it will be necessary to import data from a variety of sources and make that data work together. It’s time to start building on what we’ve learned over the last few days to accomplish this feat. Now we need a second source of data. Follow the instructions in my post Creating Tables in PowerPivot to enter the data below into Excel 2010, copy and paste it into a new PowerPivot table. 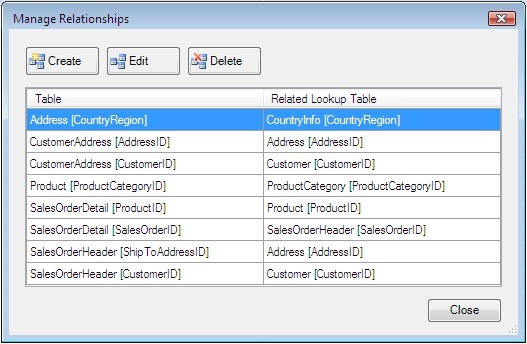 If you recall when we import data from a relational database, PowerPivot examines the foreign key relationships found in the database to create relationships between the tables it imports. In this situation though, the CountryInfo data didn’t get imported from a database, instead it was pasted in from a manually entered spreadsheet. Thus, PowerPivot has no information with which it can implicitly create a relationship. We do want to create one however, so we can link the longer country name in the Address table to the CountryInfo data and thus be able to use the briefer country abbreviations. As PowerPivot was designed to work with many sources of data, it has an easy way to create these relationships. In the PowerPivot window, click on the Table tab at the very top. All the way to the right you will notice a button group named Relationships. Click the Create Relationship button. As the above dialog shows, this allows you to create a relationship, or a link between two tables in PowerPivot. Here we are creating a link between the Address table and the CountryInfo table on the CountryRegion field. When complete just click Create to create the relationship. 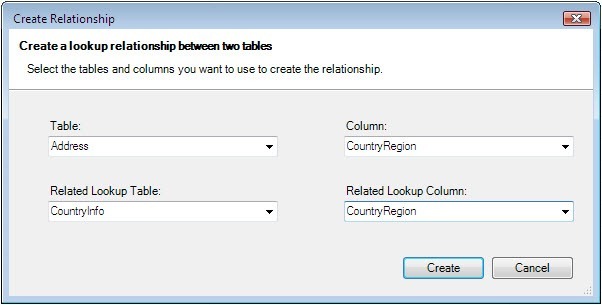 If you want to verify the relationship was indeed created, or review any of the relationships PowerPivot inferred when it imported the tables from the AdventureWorksLT2008 database, just click the Manage Relationships button in the Table Toolbar’s Relationships group. On the very first row you’ll see the newly created relationship between the Address and CountryInfo tables. You’ll also see the other relationships that were created during the import process from the SQL Server database. The three buttons at the top let us Create new relationships, Edit existing ones, or Delete ones no longer needed. Note that the altering or deleting of relationships has no effect what so ever on the original source data (SQL Server or the Excel 2010 spreadsheet). It only affects the tables as stored in PowerPivot. Now let’s see the new relationship in action. Close the Manage Relationships window, and on the PowerPivot Home tab create a new PowerPivot table (Pivot Table, Single Pivot Table). Go ahead and put it in a new worksheet. 1. SalesOrderDetail linked to SalesOrderHeader on the SalesOrderID column. 2. SalesOrderHeader linked to Address on the ShipToAddressID=AddressID. 3. Address linked to ContryInfo on the CountryRegion column. To validate this for yourself, just return to PowerPivot and look at the Manage Relationships dialog to see all the links. The need to combine data from many sources is a common task, one that will most certainly be done by users of PowerPivot. Using the techniques shown here, you can create and manage the relationships that will link data from these disparate sources together and leverage the power of PowerPivot.